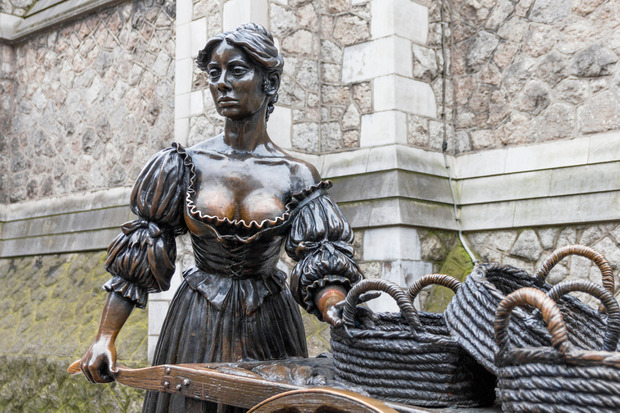 If Molly Malone Could Talk – What Would She Say? Lord Mayor of Dublin Nial Ring, Talking Statues competition winner Michaela McMahon and Mark Rowlette, Manager of Dublin at Failte Ireland. If Molly Malone was alive, alive-oh, what would she say? 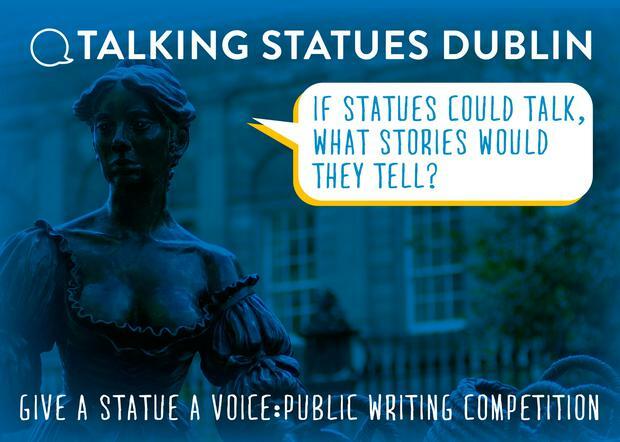 Now we have an answer, thanks to Fáilte Ireland’s Talking Statues project. ‘Dublin’s Talking Statues’ allows visitors to “take a call” from statues ranging from Oscar Wilde to Cú Chulainn – by using smartphones to swipe a QR code (or access a weblink) featured on plaques erected alongside. After swiping, you get a call back from the statues… voiced by stars including Gabriel Byrne, Andrew Scott, Ruth Negga and Brenda Fricker. Molly Malone’s statue on Suffolk Street is the latest addition, with her words narrated by actress and singer, Maria Doyle Kennedy. The new script was written by US student Michaela McMahon, who beat 150 entrants to win a public competition and attend the Dublin launch this week. Michaela is studying English Literature and Cultural and Historic Preservation in the US, and had just completed a semester at University College Cork as an exchange student when she won the open competition. While most of the Talking Statues are of real people, she describes the fictional fishmonger as “more of a symbol”, which presented its own writing challenges. 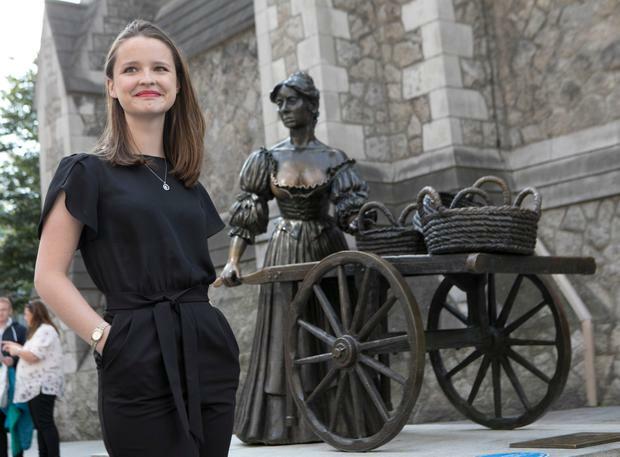 Dublin’s Talking Statues project is developed in conjunction with arts producers Sing London with the assistance of Dublin City Council, OPW, Trinity College, The National Gallery, The GPO and The Abbey Theatre. I’m not sure what I wait for. In life, I would dangle my pale feet off the wharf towards the dark Liffey while waiting for the tide to carry the bright-hulled fishing boats in. I sold my goods on the noisy streets of Dublin. And I would have continued, if I hadn’t fallen ill. Even the smallest illness was serious. Dublin is different now. So many streets. And at one time I knew them all. They are like rivers you know. People flow much like water, ambling aimlessly, or hurrying down Grafton purposefully; eddies of people swirling past like the Liffey after a cleansing rain. And my little street in the middle of it all. Quite exciting. And dizzying somehow. I never want for company. People can be a little too familiar with me though – not my fault I’m stuck in this dress. I certainly didn’t choose it. The things people do sometimes, and all in the shadow of a church! If I could move – well. I do like visitors though, when people are polite, and do not take endless selfies. I would take pictures for them if they asked. And if I could. I smile a little when someone walks by humming the song – “alive, alive, oh.” Funny how I ended up in a song. I wish I could ask for flowers – any type really. You miss little things while on a plinth. I can still tell you with certainty where to find the best seafood in Dublin. Immobility means nothing in that case. Just don’t ask me what I think of mussels. People watching – a favourite from my perch, as it was when I pushed my cart. I like my rock amongst the river. Dublin is a good place to rest.